Can't change the weather, the sidewalk, or the noise level? Try changing the time, and share something new with your dog. Suburban bird dog owners are, well, suburbanites. Most of us live in a semi-urban area, or near enough to a large population center that we regularly overload - and have essentially numbed - most of our senses. But adding a gun dog to the family can be a real eye, ear, and nose re-opener. Flushing and pointing dogs, ultra-specialized bundles of DNA that they are, exist specifically to extend a human hunter's own senses and physical reach in the field. That capability and drive isn't switched off back at the cul-de-sac. The pup's equipped for the job whether or not she's ever encountered an upland game bird, and she's stimulated by everything around her, whether or not it's the game she was bred to point, flush, or retrieve. Long-time bird dog people pick up an acute awareness of, if not what their dog is sensing, at least when their dog is sensing something particularly interesting. New bird dog owners, or those that haven't had a chance to work their dog at length in the field, sometimes miss the subtle cues and fascinating insights that can come from really tuning into Rover's Radar. Picking up early on the signals being sent will make for a better hunting team, but will also head off some of the predictable unpleasantness of living with an energetic predator in a suburban setting. Luckily we don't have to do any time travelling to see and understand our gun dogs' ancestors and the source of their primal DNA. It's helpful to sometimes remind oneself just what an upland bird dog is. A purebred hunting dog is the distillation of some very carefully cultivated blood. All domestic dogs descend from a scant few flavors of ancient wild species, and for most northern hemisphere animals, let's just keep it simple and call those ancestors what they primarily were (and still are): wolves. If you can get past some of the more sensational or sentimental presentations, spend an occasional hour watching something from the Discovery Channel or National Geographic. "Wolf" shows are never more than a few weeks apart on cable somewhere (though not as frequently as the myriad shark-related shows!). As you watch footage of those wonderful, primeval creatures hunting and socializing, look for the things that still echo in your own animal (and, for us enthusiastic amateur anthropologists, watch for the stuff that you can also observe in any group of teenagers roaming the mall). Replace those wolves' wiry coats with something silkier, replace the natural perk ears with a houndy set of dropped ones, adjust a bit for size, mellow the killer instinct only a little bit... and there's Rover, more or less. Wolves are supreme generalists, adapted beautifully to their wide range of prey and circumstances (hunting everything from mice to mule deer in terrain from deep woods to tundra). But like all generalists, you won't see them routinely exhibiting the sort of highly specialized behavior for which purposefully-bred modern bird dogs are famous. But the hints are there. Tuned into Animal Planet, really watch that wolf pack hunting behavior. In your mind, replace one of the wolves with Uncle Harold, carrying that new Browning he bought himself for his birthday. Replace another with Uncle Harold's flush-crazy Springer spaniel, and yet another wolf with your trusty pointer or setter. In a wolf pack, each animal has essentially the same wiring and basic set of skills as the next. But because of the deadly-serious social hierarchy in the pack, different animals will take on different roles while hunting. With jumpy (never mind dangerous) game, wolves are very cautious, methodical hunters. Some will flank, some will set up a skulking ambush, some will drive, and some will even point. Of course, they're accomplished solo hunters as well (especially on small prey like rodents or nesting birds), but it's their native teamwork, and their capacity - with maturity - to recall and anticipate the payoff of that teamwork, that makes our favorites of their domestic descendents such great upland hunting companions. Our more specialized modern breeds have been groomed for specific tasks. With some obvious exceptions such as bloodhounds, there's room for debate about whether individual senses have or have not been significantly altered. Sight hounds certainly see well, beagles definitely operate on the tiniest whiff of rabbit trail, terriers clearly deal well with subterranean complications, and so on. But in the subset of upland-oriented dogs, what separates a flushing dog from a pointer or a retriever? A spaniel wants to charge in and stir the pot, while a setter wants to stylishly show her hunting partners where to carefully send in the flusher (whether human or spaniel). Certainly spaniels, setters, pointers, and retrievers can be said to have broadly different body types, but that only helps them better handle a long day of what they're specifically asked to do. The most significant difference is in their programming. Ranging, flushing, pointing, and retrieving are behaviors that are all found in the original lupine (wolf family) DNA, but which, through breeding, have been amplified or suppressed. Of course, a barrel-shaped Lab is more buoyant, a short-legged beagle is closer to the footpad scent he's following, and a long-legged (but short-haired!) pointer can elegantly dance through and over their favorite game's cover. Body type matters, but means nothing absent the specialized behavior it's meant to support. But there is no new behavior among our carefully selected canine bloodlines, only specializations and amplifications of what the wolves and coyotes and foxes have done for untold thousands of generations. A wolf will, on entering the scent cone of hiding prey, lock up just like a pointing Vizsla. If she's alone, she'll use that ominous pause in her stalk to induce a little stationary panic into her prey. Watching that electric moment between pause and pounce will remind many a pointer or setter owner of walking up on the scene of a glorious point and muttering under their breath, "Come on, sweetie, please be steady good girl please be steady it's ok please be steady I've got the shotgun not you please be steady what a good girl..."
But the drama that unfolds after a wolf or a domestic hunting dog becomes aware of game is always exciting. Sometimes a little too exciting if you're trying to keep a big male Weimaraner that's all hopped up on rabbit scent out of the suburban traffic or the poison ivy. Making it a contest of speed and strength is just unworkable for most handlers. And making it a contest of senses means that the human (with his pathetic nose and lackluster hearing) will lose every time. Rather, it needs to be a matter of wits. Aside from the fact that we've all met dogs that are far, far more clever than their owners, it's possible for a thoughtful handler - even a non-hunter - to anticipate the circumstances that will fire up Rover's prey drive before it gets in the way of a manageable walk. Here's an interesting experiment: walk Rover at about 2:00AM, on the calmest moonlit fall night you can find. For a lot of latitudes, 2:00AM is a lot more "midnight" than by-the-clock midnight is. With any luck, you'll be outside when the ambient noise level is at its lowest, and there's a gentle, ground-hugging breeze rustling the leaves. First, this is just fun because it's something Rover doesn't always get to do, so it's mentally stimulating and adds experience. And since one of Rover's top responsibilities as a hunting dog in suburbia is to continually shake up his family's routine, every new adventure that wouldn't otherwise happen further validates Rover's place in the household. So, out there in the quiet moonlight, you have a chance to experience some things that you might otherwise miss. Mostly, start the walk calmly, and just use your ears. If you're walking a routine path, now's your chance to ignore what you're barely able to see in the dark anyway, and listen for changes in Rover's breathing. Long before you might normally register Rover's interest in an upcoming hedge or pile of brush, you'll probably hear the air start to really whistle through his flaring nostrils. Then will come the quick change of tone as he opens his mouth a bit, to huff the air over his tongue, as well. If you've kept the walk peaceful, he's not panting from any exertion, and you'll get to hear his olfactory radar going into overdrive. Of course, Rover is also listening to things he doesn't usually get to hear. His (quite literally) super-human hearing will be picking up the stirring of nocturnal rodents and the yowl of two dueling Tomcats half a mile away. If there's a neighboring strip of woods or park, the two of you could easily hear the eerie chatter of a vixen fox still coaching the summer's kits (probably on the topic of those same nocturnal rodents). Other than the always-useful and nearly fruitless opportunity to remind Rover how to walk at a pleasant heel, such a non-standard outing is a break in your routine and a chance to reflect on the nature of the dog. He's not a Lasa Apso that, more than anything, simply wants to be with you. He's a hunting animal, with those instincts very much in the foreground of his behavior and motivations. The companionship you share is priceless to both of you, but Rover doesn't think of things quite that abstractly. Especially when he's still in his doggy teenage years (say, under four years old), new sensory stimulation will absolutely rule his attention. Learning to anticipate the circumstances that will flip on that hunting switch, and being ready to shape his response to what he senses will make everyone happier. Make a habit of having fewer clockwork habits, and both you and Rover will become more adaptable, worldly, and able to make more of the unexpected - on the neighborhood walk and in the field. 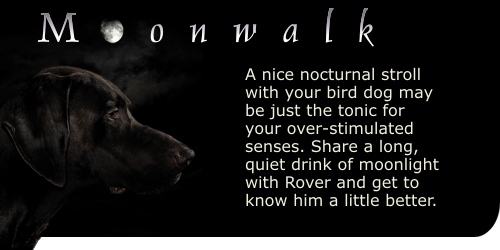 Plus, a midnight stroll can undo much of what the more frantic daylit world can make you do to yourself, and don't think Rover doesn't know it, too.